Having crystals so small that individual crystals cannot be seen under ordinary optical microscope, but are detectable by effect under crossed polars; a full rotation of a cryptocrystalline material between crossed polars will show the stone transmitting light in all positions. A good example of a cryptocrystalline material is chalcedony. 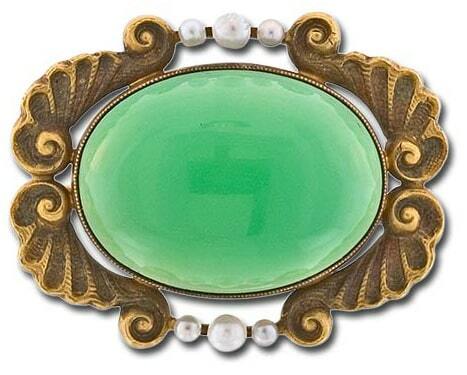 Early 20th Century Pin Centered with a Translucent Oval Cabochon Chrysoprase (Cryptocrystalline) Chalcedony.